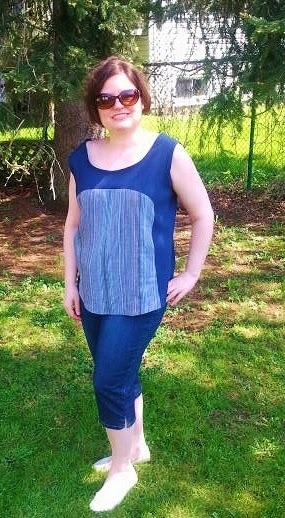 Last weekend I made this Polly Top from By Hand London. 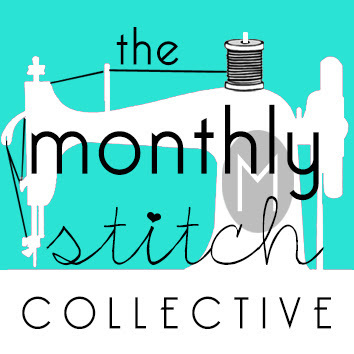 It's a free downloadable pattern, and so I thought I'd check it out for Sew Indie Month. 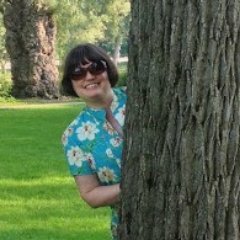 I've seen many, many, examples of BHL's fabulous Anna and Elisalex dresses all over the sewing blogosphere but not too many of these tops. So I printed it off and got busy, and searched the stash for some suitable fabric. 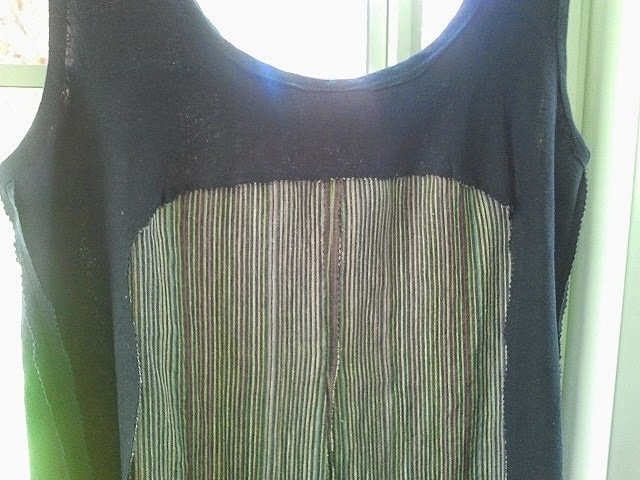 I had a bit of grey striped linen from a dress I made last summer, but it was only a narrow remnant. 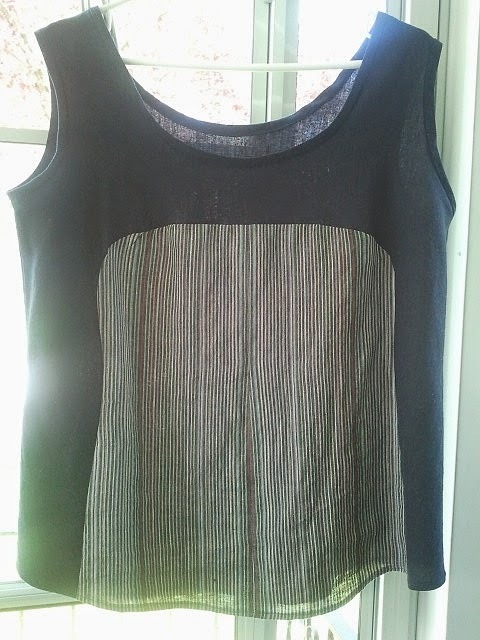 So I cut the front insert of the top in two pieces and sewed it up along the middle -- the stripes made it a little more tricky so I had to be exact. Then I had some lovely navy linen that I bought a year ago, which matched perfectly, so I used that for the main body and the neck and arm binding. It went together fairly easily. The hardest part was the curve around the top of the insert -- but their instructions are good and give suggestions and tips as to how to make this work. I think beginners would be able to easily create a lovely and successful top while learning a few new techniques. This was definitely a one day top as it is really simple. I finished it off with what is the best bias binding I've ever done -- yay! Nice and even. I think the linen I was using helped as it cooperated beautifully with everything I wanted it to do. I really like the simplicity and the slight difference that the contrasting insert adds to the this top. One thing I did notice though, was that the sizing was off for me. I cut a 12/16, and it's a bit too large. It slips off my shoulders, and so I'll only be wearing it very casually, mostly at home, I think. I also had to take a half inch out of the length of each of the shoulder pieces, front and back. Next time I'll measure again before cutting, and think I'll narrow it by an inch at centre front on my next try -- I always forget that tops fit me better when I take them in at centre front, until I'm done. Sigh. Anyhow, I like the pattern and the ease of construction, and can see how this could be made up in many different ways. I like my slightly oversize linen version and have ideas for other looks as well. Has anyone else made this one? I've printed this pattern out but haven't tried it yet. I can't wait to jump in now though, your version is so cute! I'm off to the stash closet to see if I can find a good fabric match.... Thanks for the helpful review! I have muslined this pattern, but haven't made a final version just yet. Want to get back to it as I think it is really unique! Your version is very cute. How cute is that....love your fabric from your stash. I too have down loaded this pattern, have yet to make it. Hope I printed it ok...have never cut out a pdf pattern. After seeing your top will have to give it a try! This pdf was pretty easy to put together, if you have a nice large surface like a dining room table ;) I'm getting more used to pdf patterns now that I'm trying more indie patterns -- I really didn't like them at first. Hope it works out for you!